Flamingo Park is located in the heart of South Beach. This Miami Beach park is a very interesting Miami tourist attraction. No matter what you are interested in, Flamingo Park has something for everyone. It is a highly recommended thing to do in Miami and is perfect for the whole family. At Flamingo Park Miami Beach, kids can play while dads enjoy a soccer match. Pets also have their place at the park within the two secured Bark Parks. Flamingo Park is perfect for joggers and runners; in fact, the park has a great running field. If running is not your thing, enjoy a wonderful stroll and the park’s relaxing ambiance and tropical foliage. Flamingo Park offers a perfect playground for locals and tourist. 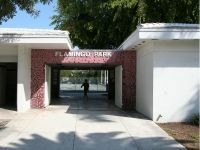 The Flamingo’s facilities include a swimming pool, a pool for the kids, tennis courts, basketball courts, a baseball stadium and soccer field as well as a gym sponsored by the Police Athletic League. The City of Miami Beach Parks and Recreation Department offers a broad range of Learn to Swim Programs, Miami Beach aquatic classes and clubs for children and adults of all ages.